Prof. Andy Sutton delivered his annual IET talk last month which was held the 6th Annual 5G conference. You can watch the videos for that event here (not all have been uploaded at the time of writing this post). His talks have always been very popular on this blog with the last year talk being 2nd most popular while the one in 2017 was the most popular one. Thanks also to IET for hosting this annual event and IET Tv for making this videos available for free. The slides and video is embedded below but for new starters, before jumping to this, you may want to check out about 5G Network Architecture options in our tutorial here. 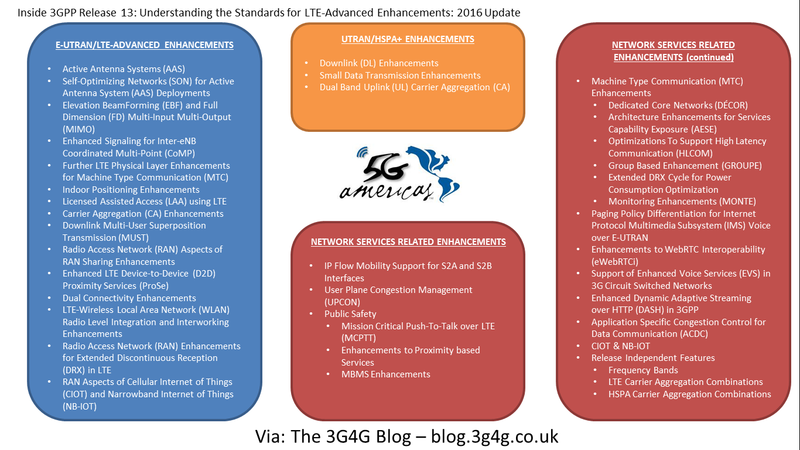 As always, this is full of useful information with insight into how BT/EE is thinking about deploying 5G in UK. Looks like I re-visit CoMP every Q1 of the year. 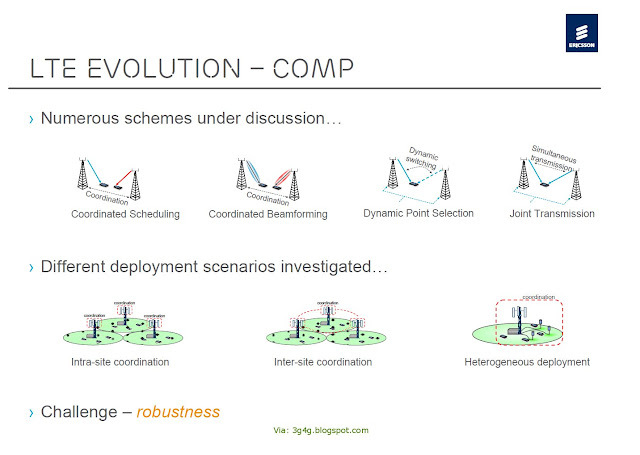 Couple of years back, I had posted a primer on CoMP here and last year I had a slide on schemes and deployments here. With Release-11 out of the door and Release-12 getting in full swing in the standards, its time to re-visit this topic in a bit more detail. There are couple of presentations, one completely devoted to this topic and one that has a section on it. Both of them can be downloaded from slideshare. The discussions from the workshop should be used to define the work plan for Release 12 and onward in TSG-RAN. RWS-120010 Requirements, Candidate Solutions & Technology Roadmap for LTE Rel-12 Onward NTT DOCOMO, INC.
CoMP is a technology which sends and receives signals from multiple sectors or cells to a given UE. By coordinating transmission among multiple cells, interference from other cells can be reduced and the power of the desired signal can be increased. The implementation of intracell/inter-cell orthogonalization on the uplink and downlink in LTE Rel. 8 contributed to meeting the requirements of capacity and cell-edge user throughput. On the downlink, simultaneously connected UE are orthogonalized in the frequency domain. On the other hand, they are orthogonalized on the uplink, in the frequency domain as well as the code domain, using cyclic shift and block spreading. It is possible to apply fractional frequency reuse (A control method which assigns different frequency ranges for cell-edge UE) to control interference between cells semi-statically, but this is done based on randomization in LTE Rel. 8. Because of this, we are planning to study CoMP technology, which performs signal processing for coordinated transmission and reception by multiple cells to one or more UE, as a technology for Rel. 11 and later in order to extend the intracell/ inter-cell orthogonalization in LTE Rel. 8 to operate between cells. There are two ways to implement CoMP technology: autonomous distributed control based on an independent eNode B configuration, or centralized control based on Remote Radio Equipment (RRE) (Figure 7). With an independent eNode B configuration, signaling over wired transmission paths is used between eNode B to coordinate among cells. Signaling over wired transmission paths can be done with a regular cell configuration, but signaling delay and overhead become issues, and ways to increase signaling speed or perform high-speed signaling via UE need study. With RRE configurations, multiple RREs are connected via an optical fiber carrying a baseband signal between cells and the central eNode B, which performs the baseband signal processing and control, so the radio resources between the cells can be controlled at the central eNode B. In other words, signaling delay and overhead between eNode B, which are issues in independent eNode B configurations, are small in this case, and control of high speed radio resources between cells is relatively easy. However, high capacity optical fiber is required, and as the number of RRE increases, the processing load on the central eNode B increases, so there are limits on how this can be applied. For these reasons, it is important to use both distributed control based on independent eNode B configurations and centralized control based on RRE configurations as appropriate, and both are being studied in preparation for LTE-Advanced. 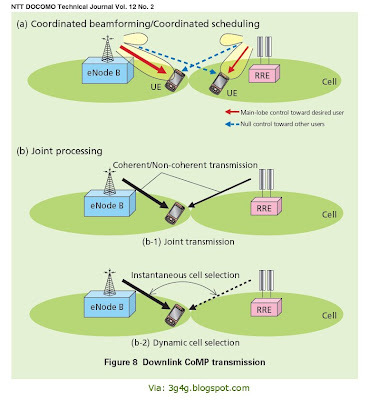 Downlink coordinated multi-point transmission can be divided into two categories: Coordinated Scheduling/ Coordinated Beamforming (CS/CB), and joint processing (Figure 8). With CS/CB, a given subframe is transmitted from one cell to a given UE, as shown in Fig. 8 (a), and coordinated beamforming and scheduling is done between cells to reduce the interference caused to other cells. On the other hand, for joint processing, as shown in Fig. 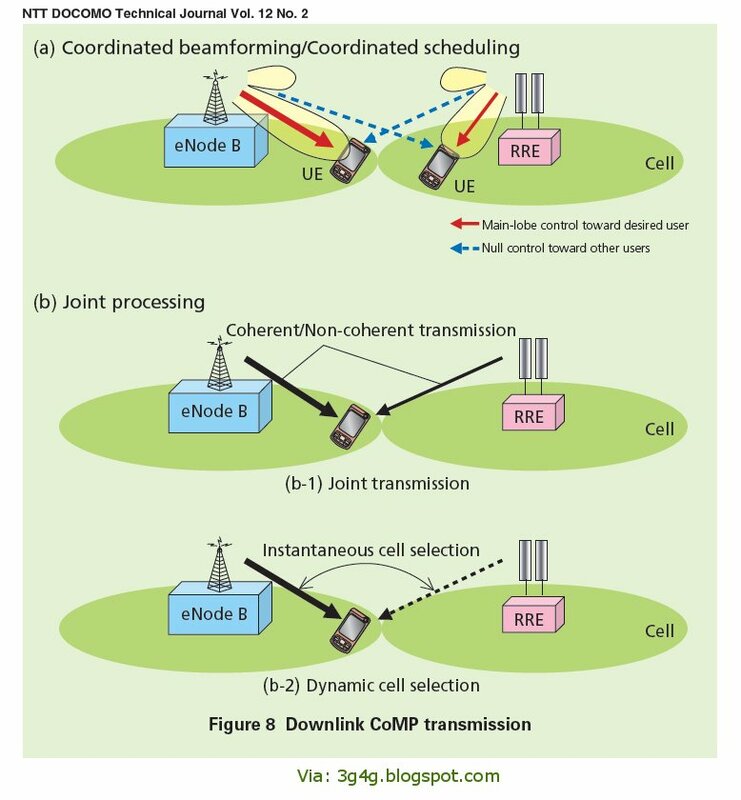 8 (b-1) and (b-2), joint transmission by multiple cells to a given UE, in which they transmit at the same time using the same time and frequency radio resources, and dynamic cell selection, in which cells can be selected at any time in consideration of interference, are being studied. For joint transmission, two methods are being studied: non-coherent transmission, which uses soft-combining reception of the OFDM signal; and coherent transmission, which does precoding between cells and uses in-phase combining at the receiver. With uplink multi-cell reception, the signal from a UE is received by multiple cells and combined. In contrast to the downlink, the UE does not need to be aware of whether multi-cell reception is occurring, so it should have little impact on the radio interface specifications. The Path to 4G: LTE and LTE-Advanced presented by James Seymour, Alcatel Lucent in 4G World, 20th Oct. 2010. CoMP may be not as practical as we may think. One of the things pointed out by Dr. Ariela Zeira, InterDigital's Vice-President of Advanced Air Interfaces in the LTE World Summit was that there exists a gap between the theoretical and the practical gains of CoMP. More accurate CSI feedback from stationary relay station is possible enabling advanced non-linear precoding schemes. The industry’s first live field tests of Coordinated Multipoint Transmission (CoMP), a new technology based on network MIMO, were conducted in Berlin in October 2009. CoMP will increase data transmission rates and help ensure consistent service quality and throughput on LTE wireless broadband networks as well as on 3G networks. By coordinating and combining signals from multiple antennas, CoMP, will make it possible for mobile users to enjoy consistent performance and quality when they access and share videos, photos and other high-bandwidth services whether they are close to the center of an LTE cell or at its outer edges. 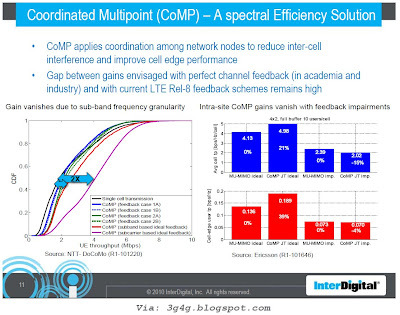 Coordinated Multi-Point transmission/reception (CoMP) is considered by 3GPP as a tool to improve coverage, cell-edge throughput, and/or system efficiency. The main idea of CoMP is as follows: when a UE is in the cell-edge region, it may be able to receive signals from multiple cell sites and the UE’s transmission may be received at multiple cell sites regardless of the system load. Given that, if the signaling transmitted from the multiple cell sites is coordinated, the DL performance can be increased significantly. This coordination can be simple as in the techniques that focus on interference avoidance or more complex as in the case where the same data is transmitted from multiple cell sites. For the UL, since the signal can be received by multiple cell sites, if the scheduling is coordinated from the different cell sites, the system can take advantage of this multiple reception to significantly improve the link performance. In the following sections, the CoMP architecture and the different CoMP schemes will be discussed. 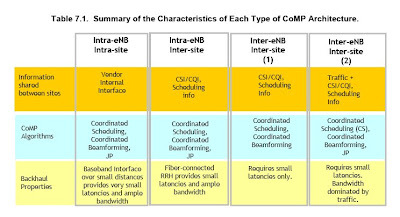 CoMP communications can occur with intra-site or inter-site CoMP as shown in Figure 7.7. 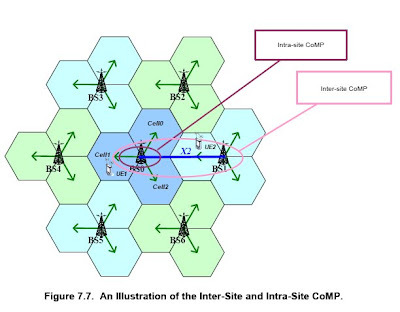 With intra-site CoMP, the coordination is within a cell site. The characteristics of each type of CoMP architecture are summarized in Table 7.1. An advantage of intra-site CoMP is that significant amount of exchange of information is possible since this communication is within a site and does not involve the backhaul (connection between base stations). Inter-site CoMP involves the coordination of multiple sites for CoMP transmission. Consequently, the exchange of information will involve backhaul transport. This type of CoMP may put additional burden and requirement upon the backhaul design. An interesting CoMP architecture is the one associated with a distributed eNB depicted in Figure 7.8. In this particular illustration, the Radio Remote Units (RRU) of an eNB are located at different locations in space. With this architecture, although the CoMP coordination is within a single eNB, the CoMP transmission can behave like inter-site CoMP instead. In terms of downlink CoMP, two different approaches are under consideration: Coordinated scheduling, or Coordinated Beamforming (CBF), and Joint Processing/Joint Transmission (JP/JT). In the first category, the transmission to a single UE is transmitted from the serving cell, exactly as in the case of non-CoMP transmission. However, the scheduling, including any Beamforming functionality, is dynamically coordinated between the cells in order to control and/or reduce the interference between different transmissions. In principle, the best serving set of users will be selected so that the transmitter beams are constructed to reduce the interference to other neighboring users, while increasing the served user’s signal strength. For JP/JT, the transmission to a single UE is simultaneously transmitted from multiple transmission points, across cell sites. The multi-point transmissions will be coordinated as a single transmitter with antennas that are geographically separated. This scheme has the potential for higher performance, compared to coordination only in the scheduling, but comes at the expense of more stringent requirement on backhaul communication. Depending on the geographical separation of the antennas, the coordinated multi-point processing method (e.g. coherent or non-coherent), and the coordinated zone definition (e.g. 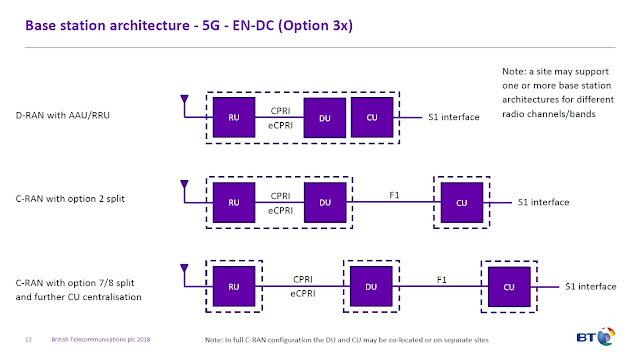 cell-centric or user-centric), network MIMO and collaborative MIMO have been proposed for the evolution of LTE. Depending on whether the same data to a UE is shared at different cell sites, collaborative MIMO includes single-cell antenna processing with multi-cell coordination, or multi-cell antenna processing. The first technique can be implemented via precoding with interference nulling by exploiting the additional degrees of spatial freedom at a cell site. The latter technique includes collaborative precoding and CL macro diversity. In collaborative precoding, each cell site performs multi-user precoding towards multiple UEs, and each UE receives multiple streams from multiple cell sites. In CL macro diversity, each cell site performs precoding independently and multiple cell sites jointly serve the same UE. Uplink coordinated multi-point reception implies reception of the transmitted signal at multiple geographically separated points. Scheduling decisions can be coordinated among cells to control interference. It is important to understand that in different instances, the cooperating units can be separate eNBs’ remote radio units, relays, etc. Moreover, since UL CoMP mainly impacts the scheduler and receiver, it is mainly an implementation issues. The evolution of LTE, consequently, will likely just define the signaling needed to facilitate multi-point reception. 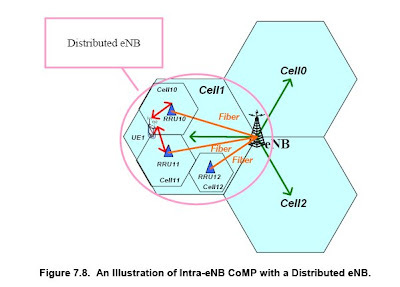 Another simple CoMP transmission scheme which relies on resource management cooperation among eNBs for controlling inter-cell interference is an efficient way to improve the cell edge spectral efficiency. The Inter-Cell Interference Coordination (ICIC) enhancement currently being studied for LTE-Advanced can be classified into dynamic Interference Coordination (D-ICIC) and Static Interference Coordination (S-ICIC). In D-ICIC, the utilization of frequency resource, spatial resource (beam pattern) or power resource is exchanged dynamically among eNBs. This scheme is flexible and adaptive to implement the resource balancing in unequal load situations. For S-ICIC, both static and semi-static spatial resource coordination among eNBs are being considered.